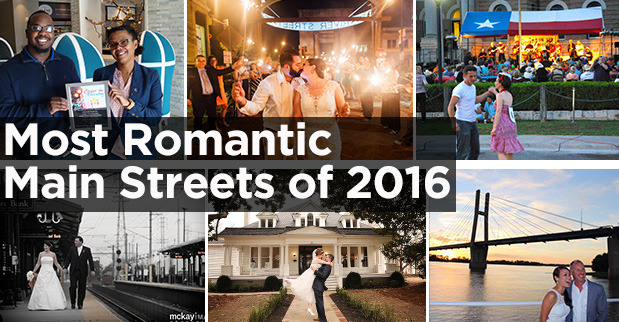 In honor of Valentine’s Day, we once again scouted the nation for Main Streets to love! Whether you prefer cozy small towns, southern charm or big-city neighborhoods, these amorous destinations will have you packing your bags for a romantic weekend getaway. And note that this beauty does not come easy—behind each of these pretty faces is a Main Street organization dedicated to keeping its historic downtown or urban neighborhood growing and glowing while preserving what makes it so special. Here’s a list of the Most Romantic Main Streets we could find, with tips for a dream date to remember. You can also check out the selected Main Streets on Curbed.com! Downtown Batavia, 40 miles west of Chicago, boasts historic limestone buildings and a brand new woonerf—a Dutch-style shared street Opportunities for year-round romance abound in this river-front community, including ice skating on Depot Pond, marshmallow roasting on Aliano’s Ristorante’s patio, kayaking on the Fox River, and Shakespeare on Clark Island. If you go: Start the day with a morning date at the Batavia Farmers Market, munching fresh chocolate croissants while you you stroll and chat with vendors. Be sure to buy provisions for a picnic lunch for two on Clark Island, accessible by pedestrian bridges over the Fox River. After some shopping along the woonerf, plan for a romantic Italian dinner on Gaetano’s open-air patio. Stay over at the nearby Hotel Baker in St. Charles. Quincy sits on the banks of the mighty Mississippi River and is known for majestic old homes and a thriving arts and culture community. Quincy hosts an annual summer blues concert series bringing thousands of people into the heart of The District. If you go: Enjoy a farm-fresh brunch at Thyme Square on Washington Park, then walk arm-in-arm through the four-acre square on your way to admire the Mississippi waterfront. Spend the afternoon perusing the vintage and one-of-a-kind stores along Maine Street, and then enjoy a snack at Bittersweet, a chocolate truffle shop that also serves coffee and artisan cheeses. Rustic romantics can stay the night at the River Valley campgrounds, which is just a two-mile bike ride away. Not your thing? Choose one of the many walkable hotels downtown. BONUS: There’s a special love connection between the two Illinois Main Street communities above that we just have to share! Click here to read the Main Street fairytale, as told by former Batavia MainStreet director Joi Cuartero Austin, about how she met—and married—her husband Bret, board president of Quincy’s The District, on Main Street. Dupont Circle is a historic commercial district located in northwest Washington, with Dupont Circle Park—a two-acre National Park—at its center. This dense and diverse neighborhood was once the center of the city’s arts scene and gay community. Today, Dupont Circle is a popular place for residents and visitors from all walks of life and persuasions to shop and dine—making it the perfect destination for a romantic weekend. If you go: The Embassy Row Hotel is celebrating Valentine’s Day with “Cirque du Valentine,” where guests can watch acrobats and a cabaret show, try samba dancing, and enjoy a romantic dinner in the restaurant. There’s even in-room boudoir photo sessions available for couples. Complete a romantic weekend with lunch or dinner at perennial neighborhood favorite La Tomate Bistro, a visit to the Phillips Collection to see Renoir’s “Luncheon of the Boating Party” and people-watching at the marble fountain in Dupont Circle Park. San Marcos’ historic downtown, just 30 miles southwest of Austin, offers Texas-style romance to visitors and locals alike. From its “Kissing Alley” to horse-drawn carriage rides, San Marcos has something for every couple. If you go: Wake up in a beautifully preserved historic loft, located above Sean Patrick’s pub. Fortify yourself at the San Marcos Farmer’s and Arts Market before you spend your Saturday at the annual Swing on the Square dancing, listening to live music and sampling craft beer. Hungry? Head over to Valentino’s for a heart-shaped pizza. Save enough energy at the end of the day to visit Kissing Alley, an alley-turned-lover’s nest with twinkly string lights overhead and scenic views of the courthouse. Getting carried away? They do weddings, too. Red Bank, New Jersey Left: Musicians serenade passersby and diners in the Victorian courtyard in front of the Dublin House. ; Right: A bride and groom launch their new life together at Red Bank Station. Eclectic architecture, plentiful street music and abundant blooms make historic downtown a must-visit spot. Located just a little over an hour away from New York City by car or train, Red Bank is the romantic escape you’ve been looking for. If you go: Check in to the stately 19th century Molly Pitcher Inn overlooking the Navesink River estuary, then head out for a stroll through downtown on Red Bank’s brick sidewalks. Summertime in Red Bank means overflowing flower planters and professional street musicians; in the winter, downtown is transformed into a holiday village. No matter what time of year you visit, plan for an early dinner at the always charming Dublin House, then catch a show at the Count Basie Theatre. Performances include everything from ballet to the Beach Boys. Stop in for a nightcap on your walk back to the hotel at one of the many options. Century old magnolias and Southern hospitality make historic Collierville, Tennessee, positively swoon-worthy. With a slogan of “Live Life Local,” and recognition as Parade magazine’s America’s Best Main Street, Collierville is the perfect place for a weekend getaway. If you go: Book a room at the lovingly restored Stratton House Bed & Breakfast located in the heart of the historic district. Grab breakfast at Square Beans Coffee then stroll the pathways to out the Log Cabin and charming bandstand in Town Square Park. Do some antiquing and boutique-ing at the collection of shops around the square and then head to the Silver Caboose for a Southern-style meal—it’s a must for locals and visitors alike. Plan your trip around the “Symphony in the Rose Garden” concert offered annually by the Collierville Arts Council. Over 1,000 rose bushes serve as the backdrop for a serenade by the 60-piece orchestra.